The residents of Cape Town don’t eat, they graze. And they graze exotic. In fact, it is recommended that travellers to South Africa plan their wildlife safaris towards the end of their stay. Else, it is a tad difficult digesting an animal you recently admired frolicking in the wild. Especially the elegant and playful springbok: a small antelope given to jumping into the air for no apparent reason (although possibly the reason why they are referred to as lion diet). 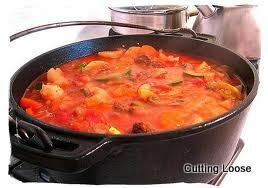 Anyhow, the springbok also makes for a delicious meal in a pot, the potjiekos. Traditionally, this Afrikaner meal is cooked in a pot over an open fire. The ingredients going in usually range from the adventurous to the experimental to the available. Even though it is time (and insides) consuming, the result is almost always delectable. Menus of fine dining establishments also list other game, such as kudu, impala, crocodile (tandoori, if you please), ostrich and the warthog. Penguins and seagulls have fallen off the list nowadays, but they were very popular with the early settlers around the Cape. Even the biltong, another favourite, akin to beef jerky, is prepared from the meat of any animal that was once large and breathing. But if you’re looking for a tasty and cheap meal on the go, it has to be the bunny chow. This is a hollowed out loaf of bread filled with a spicy curry of minced beef. 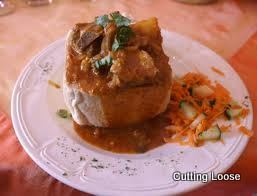 With its origins in the Kwa-Zulu Natal, (even though Minal Hajratwala attributes this creation to an uncle who migrated from Gujarat roughly a century ago, in her debut novel, Leaving India) the bunny chow is quite a favourite with locals and backpackers alike. It is however, the ubiquitous barbecue, braai that showcases the historical and multicultural effects on the cuisine of the nation. 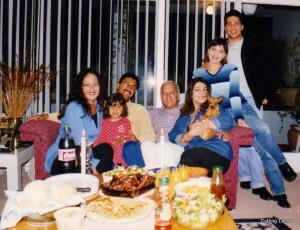 In brief, spices drew the Dutch, who brought the Malays who brought their cuisine. The French arrived with their vines. Sugar farmers brought the Indians, the gold mines the British and the Germans brought themselves. Meanwhile the local communities continued to eat game, wild greens, root vegetables, cereals and insects. 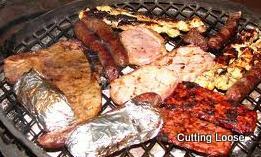 At a braai, you will find steak, chicken and the most traditional of foods called the boerewors. It is two hundred years old, means farmer’s sausage and was introduced into the cuisine by the Boers. This is accompanied by pap, a stiff savoury porridge made of maize, and a relish of tomato and onions with wild spinach as a side. Malay cuisine, perhaps the best known of South African cuisines, is represented by the bredie, a mutton stew, and a curried meat kebab on skewers called the sosatie. The presence of snoek or fish on the braai grill is purely a delightful treat for the taste buds. Samosas, although not a braai item, are extremely popular as a snack.